Note: due to the many variables involved in printing, actual printed colors may vary between computer monitors/devices and printers, as well as between different types/brands of paper & ink, and printer settings. In the "Check out" payment screen, in the "note/message to the seller" optional input COMMENTS text box, please be sure to include all of the following information to prevent any delays in processing your order. Indicate for each item exactly how you'd like it shown. I usually just cut-and-paste to avoid misspelling. so let's celebrate for the big day! You may leave #2 and #3 blank if you just want it the same as the sample. Include name, phone #, email for RSVP/REGRETS? (11) Include matching BACK for double-sided printing? Note: the matching back is not available if printing on photo paper from your local PHOTO lab, such as the 4" x 6". Back is generic. You may send a separate email with the above to (monkeyhutdesigns@gmail.com), but please be sure to include your order#. I do get quite a lot of email, so I really prefer this info be included on your actual order form entered at check-out, so that it's all in one place and I won't miss it. You will receive a PROOF/PREVIEW for your review within 0-3 BUSINESS days (NOT including WEEKENDS or holidays). Please ensure to get all needed information to me ASAP. Processing of your invitation does not begin until cleared payment & all info has been received. Mondays-Fridays 8:30am - 5:00pm PST (CLOSED weekends and holidays). Shop hours are 24 hours. VERY IMPORTANT NOTE: If it has been longer than 3 business days and you still have not received your proof, please check your SPAM/JUNK folder. Hotmail accounts, as well as schools/government organizations, tend to put my email in SPAM or block them completely. Please make sure I can communicate with you by ensuring (monkeyhutdesigns@gmail.com) is an approved email sender in your filters. If your email provider is one of the above, please provide a secondary email address NOT through those providers. Please also be sure you are checking your email address that is registered under ETSY and NOT Paypal. 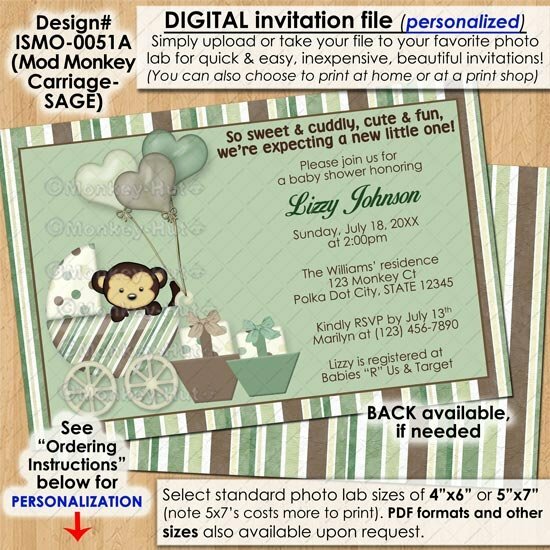 Most of my invitation designs are also available on Zazzle, if you needed PRINTED invitations instead. High quality printing, each invitation comes with an envelope, and they ship very quickly! (j) CUSTOM - your own dimensions. Please ensure you have a source to print this size if it is not standard. ● If you are printing these at a local photo lab on PHOTO paper, such as Costco, Walgreens, or Walmart, select JPG/jpeg in 4"x6" or 5"x7" (4x6's are less expensive), unless you are using their special Premium Greeting Card options. Currently, photo labs do not print on the back of their PHOTO paper option. ● If you are printing from an online place such as Vistaprint, Snapfish, Shutterfly, Mpix.com or Walgreens/Costco/Sam's Club premium cardstock options, select the JPG/jpeg in a size that the website offers. Please mention which site, so I can double-check the dimensions. Some may need bleed & trim included (safety margin areas). ● If you are printing at home or having an office supply/copy/printer center print your invitations, you will need to purchase your envelopes, as well. You can find 4"x6" (A6 size) OR 5"x7" (A7 size) at stores such as Michaels, JoAnn & Hobby Lobby. For basic white inexpensive envelopes, you can find them at office supply stores, such as Staples, OfficeDepot or even Walmart. Envelopes can also be easily ordered anywhere online, like on Etsy, eBay, Amazon & online office supply stores.